Henry Ward Beecher, the prominent nineteenth century Congregationalist minister, is reported to have said that if men wore feathers and wings a very few of them would be clever enough to be crows. There’s the problem. Crows are intelligent. They threaten our position as the most intelligent creatures on the planet. If intelligence is judged by the ability to ruin environment and destroy the planet, I guess we are the most intelligent. Crows belong to the family, Corvidae, familiarly called “corvids” (crows, jays, magpies), and the genus, Corvus. Worldwide there are about 43 species of the genus Corvus, including jackdaws, rooks, and ravens, as well as crows. In North America there are six species. The Fish Crow is fairly common in the southeast along the coast, rivers and swamps. The Northwestern Crow lives along the Pacific coast from southern Alaska to Washington State. The Chihuahuan Raven in found in the deserts of Texas, New Mexico and Arizona and southward. Rarest in North America is the Tamaulipas Crow which occasionally visits South Texas, particularly the Brownsville landfill. In our neighborhood, we have two species of Corvus. 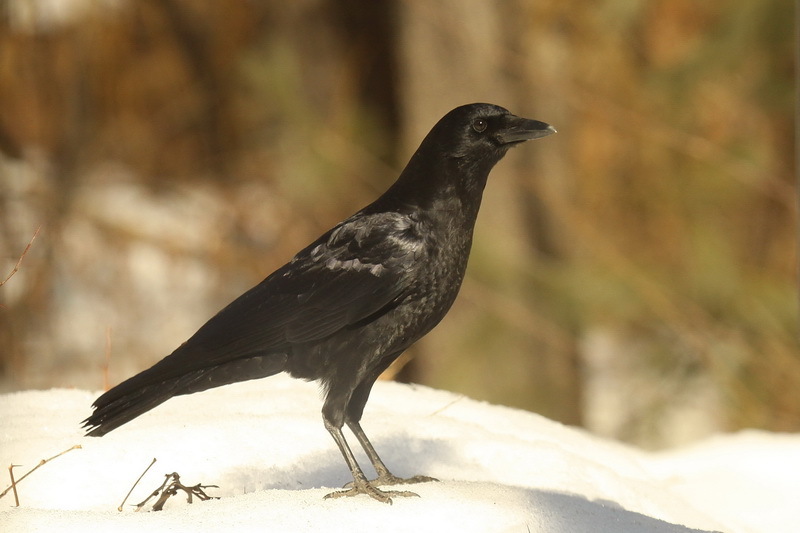 The Common Raven is still scarce, but continues to recover in our eastern mountains. It is quite common in the northern forests of Canada and in the mountains, forests, and deserts of the West. And of course, there is the widespread and common American Crow. All of these are big, black birds. They range is size from the diminutive Tamaulipas Crow (15 inches) to the hawk-sized raven (25 inches). They belong to the Order, Passeriformes (perching birds) and the sub-Order, Passeri (songbirds). Yes, crows are songbirds. Now before you begin to grumble that the raucous cawing of the crows hardly qualifies as a song and bears not the slightest comparison to the other-worldly beauty of the thrushes, remember that the Grammy Music Awards include categories for “rap” and “heavy metal.” Perhaps the corvids lost their musical ability as they evolved their intelligence, which as an evolutionary principle, seems contrary to what has occurred in our species; modern music genres suggest that musical ability and intelligence are both evolving downward. Crows are remarkable creatures. They are omnivorous. They will consume just about anything except green plants, which the youngster trying to choke down his spinach would undoubtedly see as a sign of their intelligence. Their diet includes insects, crustaceans, shellfish, small vertebrates (including nestling birds), garbage, fruit, and fast-food French fries. Corn is a favorite, which is what has made them anathema to generations of farmers. Fall and winter, crows gather in large communal roosts which can number in the hundreds, and even thousands. During the day they disperse over a wide area. Then as dusk approaches, they reassemble in staging areas before retiring to the roost for the night. The roosts are sometimes viewed as nuisances, leading officials to try all sorts of bizarre things in order to relocate or eliminate the “problem.” Among those efforts are the occasional sanctioned murder of crows in which guns blaze away at the gathered birds. Like all efforts, it has little lasting effect. The crows fly away - for a while. One problem for the crows in these large communal roosts, is that the birds perching on the lower branches often get struck by the dropping from those higher up. By morning, their backs may be speckled white. Maybe this is reflective of the cultures of more “intelligent” creatures, since it is certainly analogous to what happens to those at the bottom of the human society tree by those at the top of the tree. Little is known about these roosts, but one thought is that the roosting crows may be younger, unmated birds that have yet to establish their own territory. The roost serves a social function, allowing the younger birds to find mates, challenge one another, and communicate their experiences. Bernd Heinrich has demonstrated this theory in relation to ravens. What is evident is that crows have a complex social structure and language, although very little is understood about either. 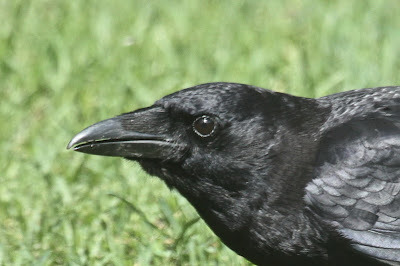 Crow vocalizations go far beyond the familiar caws that we usually attribute to them. They can imitate sounds of other species, including elements of human speech. They have a wide variety of low volume vocalizations for communicating among one another. They have alarm calls, assembly calls, distress calls, and many others. And there is evidence to suggest that they may have different languages, i.e., different groups of crows, belonging to the same species but in different geographical areas, may not use or understand all of the same calls. The March full moon is the “Crow Moon.” The cawing of the crows tells of the waning of winter. The roosts break up and by the end of March, crows begin nesting in their crow’s nests in the tops of tall trees. Quotations are from Forbush, “American Birds,” Leahy, “Birdwatcher’s Companion,” and crows.net. Very informative. Thank you for the post. Geat post and article but just because you dislike rap or heavy metal does not mean they are not liked by others. The statements came off very pretentious.